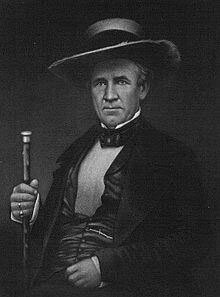 In May, 1842, the President of the Republic of Texas, Sam Houston, had an odd conversation with the French chargé d’affaires Alphonse Dubois de Saligny, which Saligny dutifully recorded in his dispatch to Paris. Houston had been trying on behalf of the Texian government to get a loan of several million dollars from France, but so far he had been unable to get his hands on the funds. During a visit Saligny made to see the President Houston at the port of Galveston, Houston had said to the Frenchman “France has need of new colonies. Why does she not look for some close to us? It would be very easy to find something among the Mexican possessions to suit her taste.” Saligny reported to his superiors that he had told President Houston that France had “renounced all idea of aggrandizement or conquest, and he did not see what right, under what pretext, or by what means she could seize some part of Mexican territory.” To which President Houston was supposed to have replied “If that is all that is troubling you, nothing would be easier to arrange. We would take care of that. If Texas were to seize a portion of Mexican territory by force of arms, and, after holding it for a time, then chose to cede it to France, I, for my part do not see who could stand in the way.” Houston was unable to complete the conversation due to the departure of the steamer he was boarding in Galveston, and didn’t have time to reveal that the “portion of Mexican territory” that could be seized by Texas and ceded to France was none other than the island of Cozumel. It wasn’t until later, in February 1843, during a coach ride with Texas Secretary of War George Washington Hockley, that Saligny was told by the Secretary the island of Cozumel was the looming target of a Texas land grab. The British Consul in Galveston, James Kennedy, had already gotten wind of this idea of Houston’s the year before, in 1841. Kennedy wrote in a secret dispatch to his home office that the Yucatecan government envoy, Colonel Martin Peraza, had traveled via New Orleans to Austin, Texas, with six bags and one box containing $8,000. The money was to pay to the Texian government to send their navy to patrol the Yucatan and stave-off an invasion by Mexican General Santa Anna. Kennedy stated Peraza’s visit that September coincided with Sam Houston’ establishment that same month of a partnership with Commodore Edwin W. Moore (Commander in Chief of Texian Naval Forces), George Washington Wheelwright (a Captain of one of the Texian schooners of war and a close friend of Houston’s), and others with the intention of buying Cozumel from the Yucatecan government.